Bird ringing in the Ottery River, Cape Town, this morning produced 64 birds in two nets - 37 birds were weavers of four species. 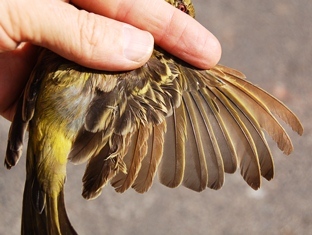 Southern Masked Weaver males are losing their summer plumage and Cape Weavers are already in winter plumage in the Western Cape. 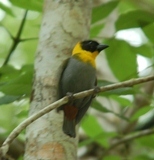 Four Southern Red Bishops (probably males based on wing length) were dull plumaged, and three Yellow Bishop males have lost their black plumage but retain bright yellow patches (photo: left). 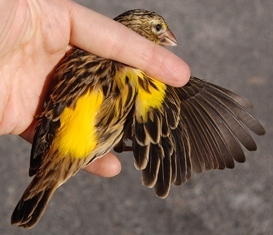 Most intriguing was a Southern Masked Weaver male (BH88029) with two waves of moult - the inner primaries are newest, followed by slightly worn primaries near the middle, and the outer primaries are much older; the left and right wings were symmetrical (photo: below). Thanks to Alex Zaloumis for helping with the ringing.